The effects of five aquarium backgrounds (transparent, white, red, blue, and black) on growth, feed utilization, digestive enzyme activities, skin coloration, muscle parameters, and carcass composition were investigated in solid red male Siamese fighting fish (Betta splendens). The fish (1.13 ± 0.01 g initial body weight) were distributed individually into glass aquaria (3.5 cm width × 8 cm length × 20 cm height) varying in color backgrounds (n = 15 per treatment). They were fed a commercial floating diet for small ornamental fish (35% crude protein) twice daily (0800 and 1700 h), and all measurements of fish were examined at the end of 8 weeks. The growth performance (specific growth rate = 0.97% body weight day−1) and feed utilization (feed conversion ratio = 1.60 g feed g gain−1 and protein efficiency ratio = 1.83 g gain g protein−1) of the fish reared on blue background were superior relative to the other treatments, followed by red background as next best (0.86% body weight day−1, 1.50 g feed g gain−1, and 1.71 g gain g protein−1, respectively). 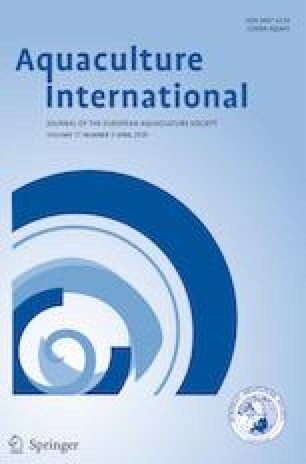 There were no significant differences in specific activities of digestive enzymes (pepsin, trypsin, chymotrypsin, lipase, and amylase) between the fish reared on blue and transparent backgrounds (P > 0.05), but significantly increased ratio of amylase to trypsin was observed in the blue treatment. Skin coloration (in terms of lightness and redness), muscle RNA concentration, and muscle RNA/protein ratio did not differ in the fish reared on blue background, while muscle actin/myosin ratio and carcass lipid increased, relative to the control with transparent background. Findings from the current study indicate that the blue-based aquarium background is appropriate for rearing male Siamese fighting fish. Funding was provided by the budget revenue (contract no. SCI590420S) of the Prince of Songkla University (PSU). We acknowledge Assoc. Prof. Dr. Seppo Karrila and the Publication Clinic, Research and Development Office, PSU, for advice in manuscript preparation.